please be aware that not all USB dongles are compatible with this BSP. Here are some compatible USB dongles that have been tested, by us, and proven to work. The following suggested Bluetooth & WiFi USB dongles can be purchased from the Terasic Website. DE10-Standard Control Panel – allows users to access various components on the DE10-Standard platform from the LXDE Desktop BSP provided by Terasic. The relative project source codes are provided in the System CD for free. DE10-Standard System Builder – a powerful tool that comes with the DE10-Standard board. This tool allows users to create a Quartus project file on their custom design for the DE10-Standard board. 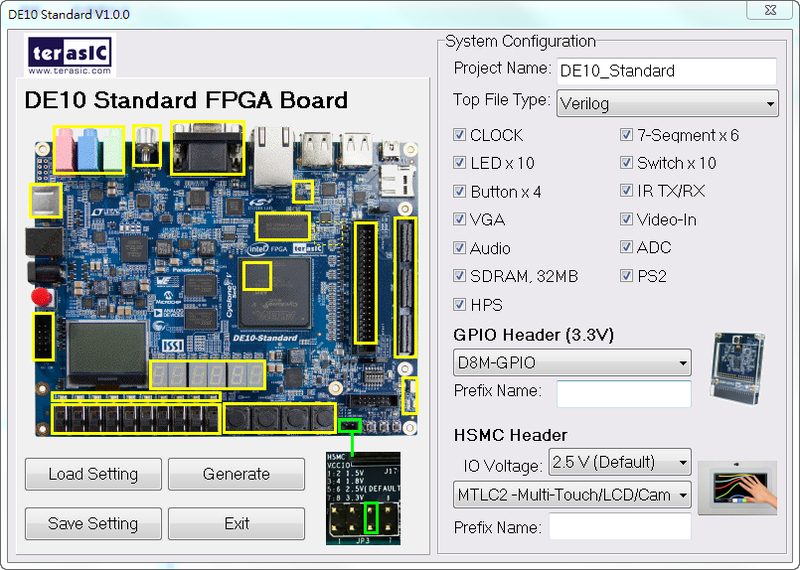 The top-level design file, pin assignments, and I/O standard settings for the DE10-Standard board will be generated automatically from this tool. In addition, through the GPIO and HSMC connectors you can select various daughter cards in conjunction with the DE10-Standard using the DE10-Standard System Builder.